Adam Smith of Malty National Brewing in Regina doesn’t dream of making a craft beer that captures huge market share. He and partner Kelsey Beach make beer to please themselves and only occasionally brew the same one twice. Nor does Smith dream of one day seeing Malty National products on store shelves across Canada. He believes craft beer is a part of local culture and doesn’t travel well over distance in any event. Smith would never dream of operating a craft brewery at a big box mall in the ’burbs. Malty National’s brewpub shares floor space with a specialty coffee shop in a residential part of the city’s Heritage neighbourhood. It took him four months and $9,000 from friend and family investors to rezone the area and turn an old, vacant grocery store into what’s becoming a community hub for craft brew and coffee aficionados. Here’s a free juice box for youngsters who arrive in tow. No one will accuse him of dreaming too big. But that’s the point. While he admits to being an irrepressible entrepreneur who’s always on the lookout for an interesting idea, he doesn’t believe in growth for growth’s sake. ‘My name may be Adam Smith, but I don’t think that’s necessary,” he says, referring to the 18th century philosopher’s contention people are driven to make ever more money. “I come to work to relax.” The name “Malty National” is a little jibe at the multinational beer companies who are trying to cash in on a trend by pretending to be small craft breweries. 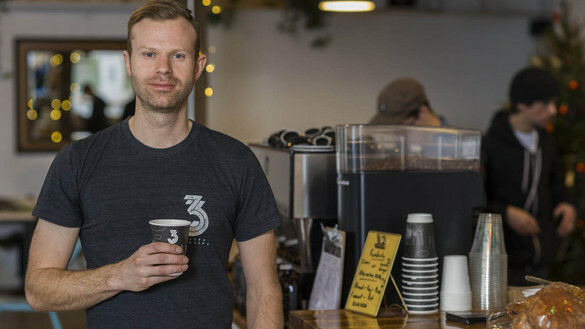 Eric Galbraith, owner of 33 1/3 Coffee Roasters, situated just down the counter from Malty National’s beer taps, says his dream is to “make something good, something I’m proud of and something that makes people excited. That’s good enough for me.” Good enough for Galbraith seems more than good enough for many others, given the growing number of people dropping by for some brew and good conversation since the two businesses began their shared-space operations early in 2016. Galbraith will soon be opening another location in the Cathedral district. Smith and Galbraith, now in their mid-thirties, were drawn together in high school over their shared love of skateboarding. “We formed a kind of counterculture with our own set of rules,” says Galbraith. “We didn’t want to do the same things everyone else was doing. We wanted to do something more interesting, something unique.” He believes they carried that outlook into their respective career choices. And certainly, if there’s another child-friendly enterprise in Saskatchewan where friends can sit down and have a beer or coffee and leave with a growler of brew and a bag of freshly roasted coffee beans, it’s even more discreet than this one. Smith says he and Beach have talked about trying some traditional advertising someday, but so far—and so fittingly— they’re happy with the engagement they’re experiencing on social media. Competition from a dozen or so other craft breweries that have popped up around Saskatchewan in the last few years hasn’t kept Smith awake at night. He’s friends with them all. He says craft beer drinkers are a curious and adventurous lot who are always looking for a new taste. “So every time someone is introduced to the world of Saskatchewan craft breweries by having a Rebellion or a Nokomis or a Black Bridge, Malty National benefits. And vice versa.” In the end, it’s not a question of how saturated the market is, says Smith; it’s about how good the beer is. “Right now in Saskatchewan, our craft brewers are killing it. Smith measures success in terms of being able to pursue his passion for beer making while maintaining a good family life—he has kids aged 5 and 2, while Beach and his spouse had their first child less than a year ago. Both men believe that creating a good family life and being a good business neighbour involves contributing to the betterment of the community where they live and work. Smith’s home is right across the street from Malty National, and all but one of the remaining handful of brewery employees live within half a block of work. Galbraith, an avid do-it-yourselfer, began sourcing specialty coffee beans and roasting them in his backyard around 2011, after he was unable to find the products in Regina—high-grade specialty beans make up just 1 per cent of global coffee trade. By 2012, he had learned enough about sourcing and roasting to turn his avocation into a small business, selling mostly to friends and relatives and trading Smith coffee for home-crafted beer. A couple of years later, Smith invited Galbraith to drop by to see the demolition underway in preparation for the opening of Malty National. “I just said to Adam ‘you know, we should open up a coffee shop here, as well.’ And Adam said ‘yeah, that’s kind of what I was thinking. I just didn’t want to say anything.’” As it turned out, Malty National’s rezoning efforts delayed the brewery’s opening until three months after the coffee shop opened in January 2016. Galbraith travels to some of the most acclaimed coffee growing regions of Central and South America to source product, often focusing on very small geographic areas. “Our Colombian is from one part of one farmer’s farm.” Like Smith, creating a high quality product, on his own terms, is critical to Galbraith’s notion of success.